Royal Canin Feline Health Nutrition Second Age Kitten Food is a combination of highly digestible Protein (L.I.P. *) and specific fibres (pysllium, FOS-MOS) to promote a balance in the intestinal flora and contribute to good stool quality. Second Age Kitten Food comes with an additional complex of Antioxidants and Vitamin E to give immune system support, as well as provide high energy content to fit this intense growth period. Kittens up to 12 months. Kittens up to 12 months. Dehydrated poultry protein, rice, vegetable protein isolate*, animal fats, maize, maize gluten, hydrolysed animal proteins, vegetable fibres, beet pulp, yeasts and parts thereof, fish oil, minerals, soya oil, psyllium husks and seeds (0,5%), fructo-oligo-saccharides (0,38%), hydrolysed yeast (source of manno-oligo-saccharides), marigold extract (source of lutein). Vitamin A: 20500 IU, Vitamin D3: 800 IU, Vitamin E: 600 mg, E1 (Iron): 40 mg, E2 (Iodine): 4 mg, E4 (Copper): 12 mg, E5 (Manganese): 52 mg, E6 (Zinc): 154 mg, E8 (Selenium): 0,07 mg. Recommended daily quantities (g/day): Water should be available at all times. Kitten's age: 1-2 months, kitten's weight 0.4-1kg, 30-50g dry food or 10-35g dry food + 1/2 can Royal Canin Babycat Instinctive. Kitten's age: 2-4 months, kitten's weight 0.8-2.5kg, 40-65g dry food or 15-55g dry food + 1/2 can Royal Canin Babycat Instinctive. Kitten's age: 4-6 months, kitten's weight 1.8-3kg, 55-70g dry food or 35-55g dry food + 1 pouch Royal Canin Kitten Instinctive. Kitten's age: 6-12 months, kitten's weight 2.8-5kg, 60-80g dry food or 35-60g dry food + 1 pouch Royal Canin Kitten Instinctive. 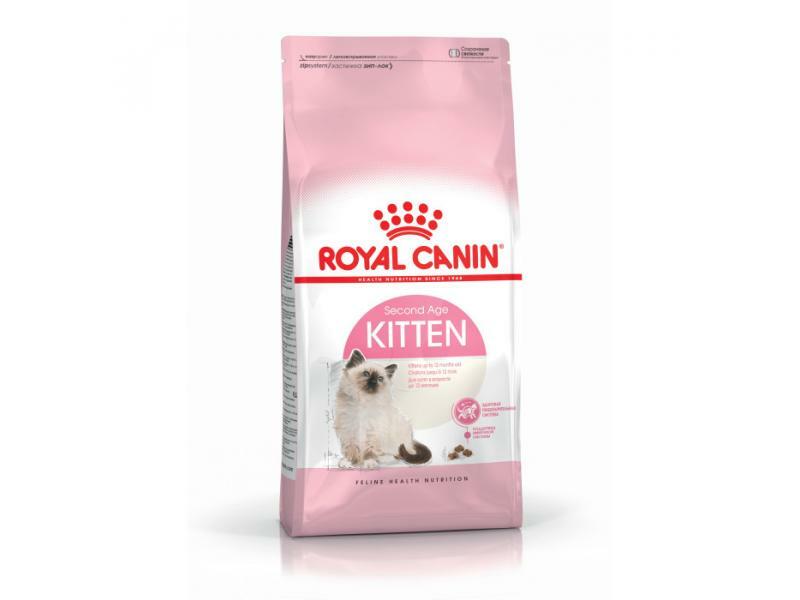 There are currently no questions for Royal Canin Feline Health Nutrition Second Age Kitten Food - be the first to ask one!